London, (The Muslim News): One person was murdered and two seriously injured in an apparent sectarian attack in a mosque in South Africa on Thursday afternoon. The attack on the Shi’a Muslims was condemned by the Sunni organisations. “We vehemently condemn the heinous attack on the Imam Hussain Mosque as well as the senseless crime committed against three innocent individuals,” said Shaykh Isgaak Taliep, Secretary General of Muslim Judicial Council. 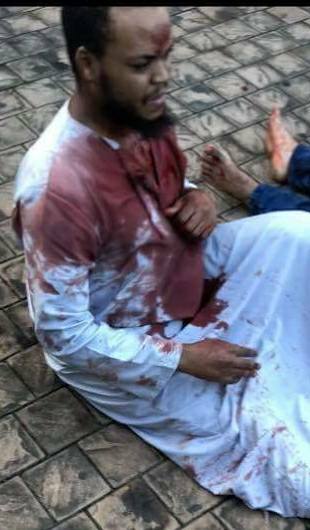 Three attackers entered Imam Hussain Masjid after midday prayers in Ottawa, Verulam, north of Durban, in KwaZulu-Natal, stabbed the resident alim (scholar), Sheikh Ali Nchinyani and caretaker, Mohammad Ali. The Sheikh jumped out of a second-floor window of the mosque to escape. Paramedics stabilised the injured men on scene before transporting them to hospital. One of the injured men, Abbas, succumbed to his injuries and died shortly after arriving at hospital. Sakina added on her face book that the murder was not about “RELIGION, COLOUR, OR CREED…no living being should be treated in such a manner…It is about HUMANITY…. Would Rasulullah Salallahu Alaihi Wasalam be pleased with us today? When Rasulullah Salallahu Alaihi Wasalam was sent to us HE was sent for MANKIND not just Muslims! Today we have lost a loved one, though what is consolation for us is that he is SHAHEED (A Martyr) he has given his life in the path of ALLAH Ta’Aalah and most definitely lived up to his name Muhammad ABBAS. Sheikh Ali said at the press conference that the attack “was a terrorist attack, there is no doubt about it. It definitely had a religious motive. They were no robbers. They strictly wanted to kill us. One of the suspect said, ‘I will kill you.’ If I hadn’t fought back I would have been killed… A person who dies protecting others the same way as this brother Abbas did, who ran from across the street towards the mosque to help the brother who was being attacked” is a martyr. Muslim organisations condemned the attacks and the killing. “CMRM has for the past five years been sounding the alarm about the growing threat of anti-Shi’a sectarianism creeping into our local community. We are appalled at the prospect of this now being a reality. Security firm, Reaction Unit South Africa, said the attackers threw a petrol bomb inside the mosque before fleeing the scene in a vehicle with no registration plates. The suspects fled in a white Hyundai Getz in the direction of Phoenix. Police are now looking for a group of three men wearing half balaclavas.